Item has been used. The item has scratches and marks. La consola está en condiciones impecables, (CHIPIDADA PARA SER COMPATIBLE CON JUEGOS ORIGINALES Y PLAYSTATION 2 COPIAS). CONDICION DE JUEGOS. -CABLE DE CABLE DE AUDIO Y VÍDEO ACTUAL. - (EL OJO NO INCLUYE LA CAJA, DESDE QUE EL MISMO SE VENDO POR SEPARADO, TODO INCLUYE TODO LO DESCRITO Y LO QUE SE APRECIA EN LAS FOTOS). Hi and thanks for looking! 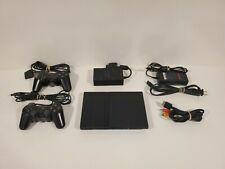 This listing is for 2 PlayStation 2 multi tap devices. They allow you to play with up to 4 players on certain ps2 games. There is one here for a slim and one for an original fat model ps2. Both of them have been tested and seem to work without any problems. They are both in good cosmetic condition. If you have any questions feel free to ask, and check my listings for other video game items! Thanks! Both work and we're tested. The only condition issue I saw with the console itself is that it makes a funny noise for the first few seconds when you turn it on with a disc in it but after a few seconds it works normally it was on for many hours with no incident. Sony PlayStation 2 PS2 SLIM Black Complete Console w/ Multitap. Condition is Used. Shipped with USPS Priority Mail. Devil May Cry Y Y Y Y. Smackdown Shut Your Mouth Y Y Y Y. 007 - Agent Under Fire Y N N Y. Grand Theft Auto - Vice City Y Y Y Y. Grand Theft Auto 3 Y Y Y Y. Madden 2006 Y N N Y. Madden 2003 Y Y Y Y.